For many weeks now, I've been closely following the new company, Educents. The best way I can describe it is sort of like a Living Social for education products and services. You may have seen me sharing some of their great deals on Facebook recently, including their Spanish learning discounts. For homeschoolers, parents, and educators it is a treasure trove! I've discovered some incredible new (to me) products that I can't wait to try with my kids. So I'm pleased to have this opportunity to offer you a fantastic giveaway in honor of Earth Day. Educents & Conscious Box have teamed up to offer you a chance to win a free Conscious Box. Conscious Box is a monthly subscription service that delivers the purest, most natural products on Earth, right to your doorstep! You’ll be introduced to the purest, most ethical companies on the planet, every month. Can you imagine the learning potential this has for your children? Every month you get a surprise package with products from 10 to 20 companies dedicated to producing green products. You and your children get to discover these new products and explore where they come from and how they benefit the Earth. What a wonderful opportunity to nurture your child's social conscience and make a difference at the same time! 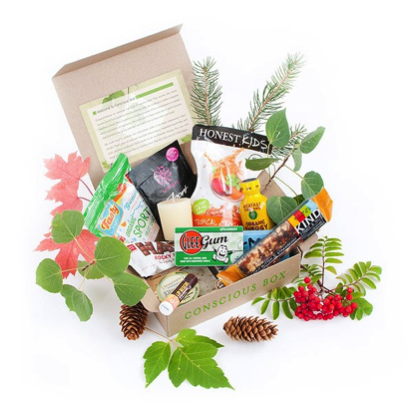 PLUS, if you aren’t the grand prize winner, you can still get a 3-month subscription to Conscious Box for less than $12/month by heading over to Educents.com. For one week only, Educents will be offering the Conscious Box for 40% off! In addition, ALL profits from the sale of this box will be donated to The One Fund, which will provide funds to help those families most affected by the tragic events that unfolded during Monday’s Boston Marathon. So enter to win, and then head on over to buy the Conscious Box for yourself or a friend to celebrate earth day and support our fellow Americans in Boston! Sign up below for your chance to win and teach your kids about being eco-friendly! Love this! Especially since I have recently introduced my son about recycling and anything else that is safe for the environment. Such a cool giveaway for Earth Day, thanks Monica for letting us know about this Conscious Box service. Would love to win the Conscious Box because as a parent I have introduced a love for natural/organic products to my child ever since he was born. Seems like the Conscious Box makes it easy for parents to do this. I've heard good things about try their service! Would love to win this! I love getting packages in the mail! I love conscious box! Great giveaway! i think this would be a cool gift idea too!! Love to try natural products! I would love to win their vegan box! Such a great way to support vegan friendly companies! What a fun way to try products!